A nation on the run. A homeland ravaged and barren. To stay would mean certain death. Going back is only considered by the foolish and those who have vowed to die on their native soil. Under these circumstances the people are truly blessed to have such an amazingly beautiful, abundantly rich, so warmly welcoming destination ahead - Ambria, the promised land of Queen Korinthia. THE CHRONICLE OF THE COPPER CROWN features two independent sequels to the tutorial adventure included in the Core Rulebook and is meant to provide players and Game Masters with more advanced guidelines regarding the rules and game world of Symbaroum. The first adventure, The Mark of the Beast, deals with different kinds of problem-solving situations and introduces the players to the town of Thistle Hold. And in the second adventure, Tomb of Dying Dreams, the Game Master gets an example on how to design an adventure landscape, while the players finally get to venture out in the vast Davokar Forest. 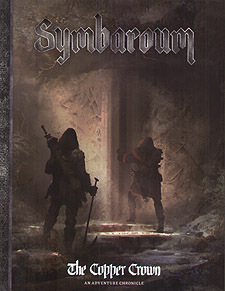 So turn down the light, make the world around you disappear, and get ready to enter the world of Symbaroum!